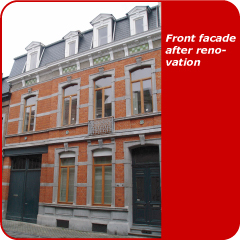 This project demonstrates that an extensive energetic renovation is feasible, even for a building with a listed façade. This dwelling serves as EcoHoms showpiece and guided tours are organised regularly to inform the public tangibly on the concept of durable renovation. In this respect the owners attempts to sensitize the tenants with regard to energy saving are also very interesting. It is apparent that these measures, in case of rentals, are vital for optimal building usage and the subsequent decrease in energy consumption.